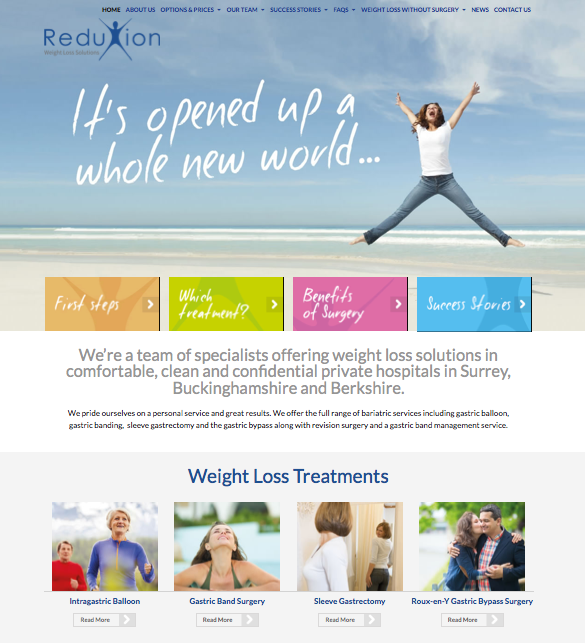 Reduxion Clinics (formerly known as Surrey Obesity Service) are providers of weight loss solutions. The company offers the full range of bariatric services including gastric balloon, gastric banding, sleeve gastrectomy and the gastric bypass along with revision surgery and a gastric band management service. Design Inc were approached to provide a complete rebranding package as the client felt that their current image was too bland, too amateurish, too clinical and that a more positive and professional ‘lifestyle’ focused approach was now required. It was now time for the brand to experience a transformation. Early discussions quickly established that the company was relying on traditional referral methods. That had believed all they needed was a website that provided basic information. However, after realising that the market was becoming saturated with weight-loss solutions (not just surgical but also medicinal, exercise regimes, diets, etc), they took the decision to reposition themselves in the crowded market and portray a fresher, younger, vibrant brand. One that was embracing rather than embarassing. It was agreed that their original name was a big part of the problem and that a renaming exercise would help add much value to the results of the rebranding process. The chosen name would provide a key part of the inspiration for the identity development and other brand assets – colours and fonts, positioning messages, tone of voice, as well as imagery. A naming exercise was carried out and, from a long list, through to the shortlist, one name stood out: ‘Reduxion’. This led to the new brand logo being designed, utilising an icon of a healthy, energetic person as the ‘X’ within the new company name. The website was totally redesigned, bringing in a much fresher look and a more approachable experience. 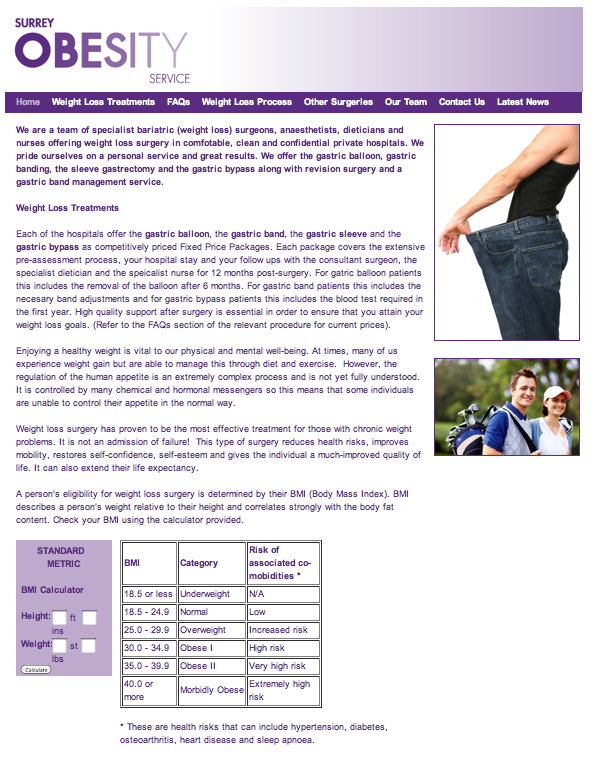 It was crucial that the website focused more on the tangible benefits of bariatric solutions rather than too much of a medical and clinical feel. As such, each page was created to engage with the visitor, to make them feel comfortable whilst, at the same time, being educated. The main marketing activity going forwards was to be SEO, drawing relevant enquiries to a new responsive and content-managed website. An expanded programme of social media marketing is currently underway in order to establish positive engagement with their patients (past, present and future). The brand makeover process and relaunch has now been completed and the results of the search and social media marketing beginning to be felt. The number of site users and relevant enquiries have increased considerably and the initial reactions of stakeholders to the look and feel of the brand has been extremely positive. The performance of the website on tablets and mobiles in terms of the impact of the design and the user experience has also been very well received and brought the business right up to speed – and beyond many competitors. Reduxion Clinics help their patients make exceptional transformations that give them back their freedom, their confidence and in many cases, their life. Design Inc are pleased to have been able to similarly transform our client with a major brand overhaul. For more information on our approach to an online brand makeover for your own business, please contact Client Services Director, Frank Norman on 01784 410380 or by email. To view our portfolio including more examples of our brand makeover work please click here.